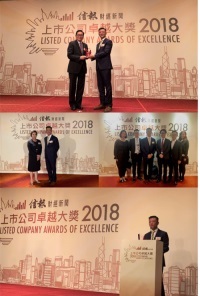 HONG KONG, Nov 7, 2018 - (ACN Newswire) - China Tonghai International Financial Limited ("Tonghai Financial") is pleased to announce that the company has been awarded "Listed Company Awards of Excellence 2018" by the Hong Kong Economic Journal. Mr. Chris Wu Kwok Choi, Chief Financial Officer of Tonghai Financial, attended the award ceremony and accepted the award yesterday. Chris Wu said "The company wins the "Listed Company Awards of Excellence 2018", which is a great encouragement and affirmation for the company and all employees. Tonghai Financial is rooted in Hong Kong and has accumulated rich experience in the industry for nearly 40 years. It has a strong network and provides diversified integrated financial services. As Oceanwide Holdings became the majority shareholder of the company last year and expanded the latter's capital base, it transformed its income structure and quality. This award represents market recognition of the company's new page. In the future, we will strive to build a leading global financial company and strive to bring rich returns to shareholders and investors. The assessment is carried out by HKEJ's EJFQ stocks analysis system and sorted candidates according to Piotroski F-score etc. The results are further reviewed and assessed by industry leaders, analysts and HKEJ's a judging committee and finally verified and audited by KPMG. The award aims to honor and select listed companies that are well-respected and outstanding within their industries as well as capital markets. The HKEJ Award provides reference indicator for investors and is viewed as one of the most prestigious awards ceremonies in the industry. Tonghai Finanical wins this award, which honors the company's outstanding performance and is fully recognized by the market and investors. China Tonghai International Financial Limited (Stock Code: 00952. HK) is a Hong Kong-based financial services group which has been listed on The Stock Exchange of Hong Kong Limited since 1997. In 2017, the group joined the big family of Oceanwide Holdings Co., Ltd. (Stock Code: 000046.SZ). Tonghai Financial is committed to building a comprehensive, full-licensed integrated financial platform. The core businesses of the Company are brokerage business, interest income business, corporate finance business, asset management business and investments and others businesses. The Company strives to become the ideal partner for both corporate and individual investors in Hong Kong and China. The Company also offers premier one-stop financial services to its clients. The Company continued to provide capital markets services through its representative office or the wholly-owned foreign enterprise in Shenzhen, Shanghai, Shenyang, Ningbo, Dalian, Beijing, Chengdu, Hangzhou and Xiamen of the PRC and through its Global Alliance Partners network and Oaklins International.